ICG is a challenging sea going career, suitable for those who are bold, intelligent and loves adventure. Both men and women can opt for a career in Indian coastal guard. As a coast guard one plays a vital role by protecting the national interests of the mother land. They have the opportunity to move around and visit different places within India and abroad. A career in Indian Coast Guard is a versatile field that offers great job satisfaction along with good pay and abundant perks. The entire coast line from Daman to Kanyakumari including the Union Territory of Lakshadweep comes under the operational and administrative control of the Commander, Coast Guard Region (West). There are 5 Coast Guard District Headquarters (Porbandar, Mumbai, Mangalore, Kochi and Goa), 7 Coast Guard Stations, 1 Air Station and 2 Air Enclaves on the Western seaboard of India. The entire coastline from Kanyakumari to Kolkata comes under the jurisdiction of the Commander, Coast Guard Region (East). 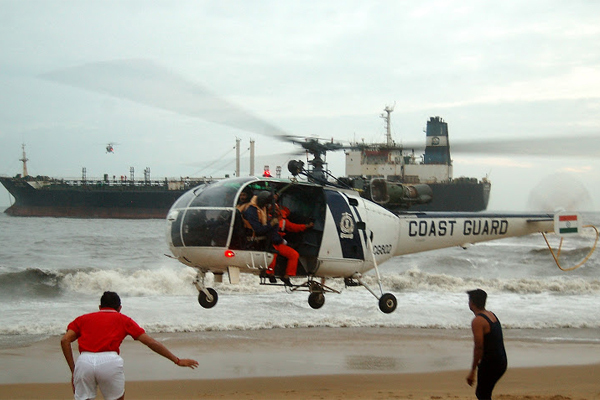 There are 4 Coast Guard District Headquarters (Chennai, Vizag, Paradip, Haldia and Kolkata), 4 Coast Guard Stations, one Air Station and one Air Enclave on the eastern seaboard of India. Port Blair District HQs are located at Diglipur and Campbell Bay. The Region has a force level of one OPV, two FPVs, two FPVs(Jet), one IPV, two IB, two Dornier aircraft and one Chetak helicopter in this region. The Coast Guard has a force level of two OPV, one FPV, one IPV, two Hovercrafts, eight IB, two Dornier aircraft and two ALH helicopters in this region.